Don’t skimp on warming up, cooling down, or stretching; otherwise, you risk stressing your heart and injuring your joints and muscles. For best results, start with a cardio warm up for 5-10 minutes (the longer your planned workout, the longer your warm up should be). Foam roll any tightness you feel in your muscles, and then stretch for about 10 minutes before your workout (preferably dynamic stretching). 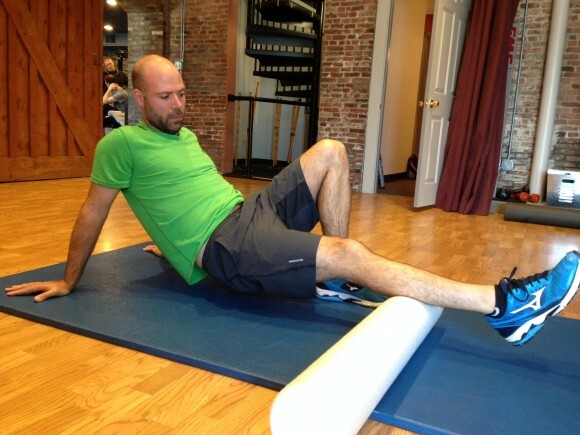 If you are unfamiliar with foam rolling and/or dynamic stretching ask a professional personal trainer. What intensity is appropriate for a warm up? You should still be able to hold a conversation after you have finished warming up. If you find yourself talking in gasps, you need to warm up more slowly. To cool down, gradually decrease your speed and intensity. The cool down should be similar to the warm up, only in reverse. Finish your workout with another 10-15 minutes of stretching, with particular emphasis on muscles that you used heavily during your workout. Wear clothing that is appropriate to the activity and the season. Layer clothing during cold weather—layers trap heat more effectively, plus you can peel off layers as necessary as you get warmed up. Choose fabrics that “wick” the sweat away from your skin. Choose footwear that fits and is appropriate to your chosen activity. Women can spare some discomfort with a supportive exercise bra. 3. Consuming “sports drinks” unnecessarily To avoid dehydration drink water. Drink 1-3 cups up to 3 hours prior to your workout or competition. It may be difficult with some sports to drink during a competition, but it is very important to drink ½ cup to 1 cup every 15-20 minutes. Remember—by the time you begin feeling thirst, you have already become mildly dehydrated! Activities performed for 60-90 minutes usually call for energy to rehydrate. If one is sweating for prolonged periods, it is likely that electrolytes are being lost. The need to replenish is important to sustain energy and avoid dehydration, especially when performing vigorous exercise in a hot climate. Most recreational exercisers do not need “energy” bars or “energy” drinks. A dull muscle ache after a workout is normal, for beginning exercisers and veterans alike. This soreness (called delayed onset muscle soreness, or DOMS) is caused by tiny tears in the muscle. It’s the process of healing these tears that causes muscle tissue to grow and become stronger. Sharp pain during a workout is not normal. Do not try to “work through” the pain, and if the pain is severe or unusual, don’t hesitate to visit your physician. Also, consult your physician about the use of painkillers, especially non steroidal anti-inflammatory drugs (NSAIDs) such as ibuprofen. Overuse of NSAIDs has been linked to ulcers and other ailments. 10. Staying stuck in a routine If you don’t alter the amount or the intensity of the exercise you perform, you are likely to plateau. To better understand how your muscles adapt to exercise, consider the effort it takes to lift a gallon of milk out of the fridge. If your body couldn’t adapt to the demand of lifting that gallon jug, then your arm would ache every time you poured a glass of milk! Add an extra workout per week. If you are a runner, increase your run volume by 10% per week. Use interval training to gradually increase your walking, running, or biking speed. For example, on the treadmill you could walk at a steady pace of 3.5 mph for four minutes, then add a “burst” at 4.0 mph for one minute, and repeat this pattern until it is time to cool down. If you are exercising outdoors, you could time your speed “bursts” with a stopwatch or use trees or telephone poles as your guides. Focus on full body movement,s which will increase caloric expenditure, giving you more bang for your buck. Try a new class, such as: Barre, ski training, Core & Stretch, TRX, or Circuit Training. Establish a mini cross-training routine at the gym. Instead of hopping on the treadmill for 30 minutes straight, use the treadmill for just 15 minutes and then finish up on the rowing machine, stationary bike, or elliptical trainer.